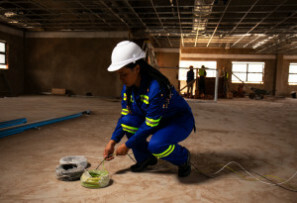 South Africa is seeing an increase in female workers in industrial environments as the traditional barriers of gender specific roles are being broken down. However, from a Personal Protective Equipment (PPE) perspective, women are still pigeon-holed with the expectation that they should wear either male or unisex PPE. There is a fundamental difference in the size and shape between a woman and man’s body, often creating discomfort and even potential risk for women. Furthermore, what many businesses don’t realise is that ill-fitting PPE is impacting the productivity of the female workforce in the workplace. The basic concept of Personal Protective Equipment (PPE) is to protect the worker from the potential hazards in their working environment. When it comes to safety footwear, the hazards may include slipping, falling objects, corrosive chemicals and solvents, sharp protruding metals and shavings and anti-static charges just to name a few. PPE is supposed to protect a person from these dangers in the workplace. If we look at a typical woman’s foot, the contours differ to that of a man’s in that the female foot is generally narrower. As such, a women’s size five shoe would need to be shaped differently to that of a man’s size five shoe, ensuring a comfortable and secure fit. A man’s shoe may fit a woman’s foot from the toe to the heel, however, it would typically be too wide in breadth. And as a result, her foot may oscillate within the shoe. Overtime, the oscillation puts strain on her ankle, which leads to strain on the knee and subsequently strain on her hip. What may begin as minor discomfit may result in injury as the years go by. In the case of women who have narrow heels, the potential of slipping out of the boot becomes a daily risk thereby counteracting the sole purpose for wearing safety footwear in the first place. Instead of focusing on the daily task at hand, a woman is being mindful of her ill-fitting footwear, thereby decreasing her productive output. In the case of workwear (such as conti-suits, boiler suits etc), the difference between the shape of a man’s and a woman’s body is more evident. Despite this, there is still a trend of procuring men’s workwear or unisex workwear for women. I believe that this is due to the fact that the consequences and daily struggles of ill-fitting workwear for women are not understood. With regards to the trousers, women naturally have wider hips and a more pronounced posterior. As a result, the pattern of the trousers needs to be cut differently to accommodate the difference in shape. Failure to do so can result in the trousers sitting below the belly button section. For women who have given birth through a caesarean section, there are often complaints that the button places unwanted pressure on the scarring area causing major discomfit. Furthermore, when a woman bends over – a task that is common for those wearing conti-trousers – the trouser waist band typically falls below her hip region exposing the top half of her posterior. This not only compromises her dignity in front of her colleagues, but often results in her wearing nylon tights under her trousers. The consequences of wearing nylon tights for a prolonged period of time, especially in the South Africa climate, have been well-documented. The nylon material does not absorb moisture and subsequently the skin remains damp and becomes a breeding ground for fungus and bacteria. When it comes to jackets, unlike men, women generally have a smaller back area, but a more pronounced chest area. There are typically two issues that arise when issuing women with men’s conti-jackets. Either, jackets are sourced to fit the waist area, hip length and arm length causing tightness in the chest area thereby restricting flexibility and movement and exposing a woman’s mid-drift when raising her arms. Alternatively, the jackets are sourced to fit the pronounced chest area, resulting in a baggy, uncomfortable fit, where the arms and hip length are compromised. The point to be noted when it comes to ill-fitting workwear is that instead of focussing on the job at hand, one’s attention is being diverted through the discomfit. According to Industrial psychologist, Uma Naidoo, if one is not comfortable in their attire, which they use for approximately eight hours of the day, this could lead to frustration, poor concentration, increased breaks and many other debilitating effects on productivity. She confirms that if you are uncomfortable in your clothing, you are not functioning at your best. Historically, industry was dominated by men. Manufacturers of PPE focused their time and effort producing garments that would suit the contours of a man’s body, in an effort to improve comfort and increase productivity. 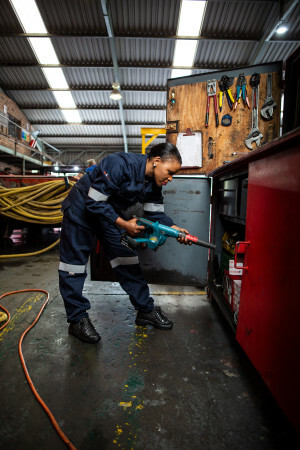 With more and more women entering into areas once deemed the preserve of men, there needs to be a shift in the way that PPE is procured for the workforce, if productivity is to be maximised. Much research has been spent looking into the ergonomics of a corporate space with proven results. If the same concept is applied to those wearing Workwear, we can conclude that the more comfortable a worker is, the better they will perform. 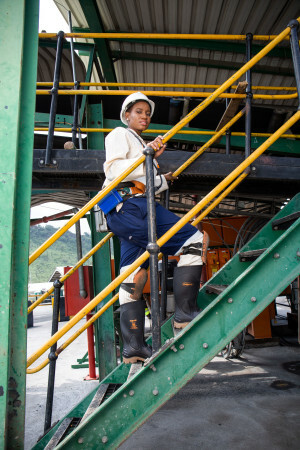 Established in 2008, Sisi Safety Wear is a brand of women-specific Personal Protective Equipment (PPE) that falls within the BBF Safety Group (Pty) Ltd (BBF) stable. Sisi Safety Wear was initially developed to provide a solution for women looking for a safety footwear offering that was suited to the contours of a women’s foot. A decade after it launched, the brand successfully expanded its product offering into workwear through its careful consideration of the functional and fit requirements of women working in industry. The Sisi Safety Footwear for Women range comprises 14 styles across 2 shapes – standard and narrow. The range is available in single density and dual density. Sisi Safety Workwear for Women range of safety wear is tailored to the contours of a women’s body. A key differentiator in the Sisi safety workwear range is that it allows for all trousers and jackets to be sold separately to ensure that those with large bust areas, but small hip areas, or vice versa, can still have a comfortable fit. Sisi’s Head Office is based in Pinetown, Durban, and focuses on making women in industry more comfortable and productive in the workplace.